Harry and May Davis Ramekins. Gee where did this design come from? Stamped letter “S” struck through horizontally in cartouche with word “ENGLAND” stamped underneath on outer edge of foot ring. I know I will get the crazies out over this one, but in the land of the blind, the one-eyed man is king. I tell it as I see it. As I say, I am not a potter, nor do I have an academic interest in ceramics. Sometimes a case of the “Emperors New Clothes” comes along. So all you purists, please take a tranquilizer before reading on. This is a website for functional pottery. There is often disconnection between myth and reality. Much of what has been written about Bernard is an example of this. What he was, and what his story has become are two entirely different things. 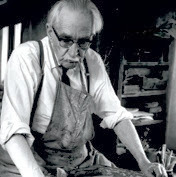 His reputation as a potter is still better known in Japan than it is in Britain because along with Kanjiro Kawai, Shoji Hamada and Soetsu Yanagi, in 1936, he founded the Nihon Mingei Kan (Folkcraft) movement there. Many references call him the “Father of Studio Pottery.” Shoji later became a Japanese “National Living Treasure”. Bernard is also called a “bridge between cultures” and any other numbers of clichés. So I will leave it to the sycophants tell this part of his story. Much has been projected onto the story of a man with a great determination who was an inspiration to a generation of potters worldwide. 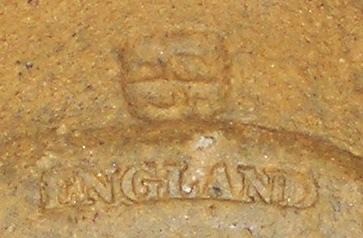 He was not as widely accepted in his day and his reputation has grown over time within the studio pottery circle. But it is still studio pottery. The best analogy I can draw is one I heard a long time ago. Anyone can build a garden shed, but only a few are capable of building a cathedral. Bernard was pretty good at his particular type of garden shed, but it ain’t no cathedral. What must be at the forefront of consideration is that while Bernard was introducing this “new” style of pottery to Britain, dozens of the great Staffordshire potteries were at their peak, producing some of the finest pottery and porcelain ever made, anywhere in the world - ever. These exceptionally talented artisans toiled for decades in relative anonymity, their artistic skills beyond compare, so it is natural that Bernard’s seemingly rough and ready pottery was viewed somewhat differently at the time. Have a look under granny’s bed, you will probably find an exquisite, functional Staffordshire dinner or tea set there. He saw his mission as raising the profile in the West of the Japanese Raku style of pottery. Few people are blessed with knowledge of their own importance and Bernard was one of them, always with one eye on history, he kept notes and diaries on almost everything. Ever the searcher, he was continually learning and searching, eventually becoming a follower of the Bah’ai faith, for whom he is something of a poster child. His early, disrupted and somewhat turbulent life shaped his future and his philosophy. Bernard Howell Leach was born in Hong Kong on the 5th of January 1887 and moved to Kyoto Japan with his Maternal Grandparents as a baby shortly after; his mother having died in childbirth. His father was a Judge with the Colonial administration and remarried shortly after his first wife’s death. Bernard returned to Honkers in 1890 and had a problematic relationship with his stepmother. When you read the story of his life and relationships, it doesn’t take Sigmund Freud to allege that young Bernie carried some serious mummy issues. Like many of his time, he was subject to the fear of a nuclear holocaust, in its time, much the same as our own doomsday cult of climate change. 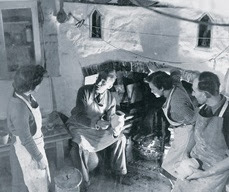 One of Bernard’s friends and pupils was Harry Clemens Davis who ran the St Ives pottery in 1933 when Bernard was off on one of his many overseas trips. Harry became infected with the same phobia and moved to New Zealand to escape the impending nuclear disaster. Harry made ramekins a lot like this one. Well folks, Bernard and Harry are now long gone and the nuclear annihilation didn’t happen. Make of that what you will. The Rameking will now get on his soapbox and launch forth on his version of climate change. I expect to get the usual rants from the interweb. The driver of our current climate change is the magnetosphere, that magnetic field around the earth working as a shield, deflecting and diverting electrically charged solar particles. (You can see this happening in the aurora borealis and the southern aurora). This shield is not total and has been weakening and become erratic over the past two millennia. Most recently over the last 20 years or so. Some dingbats see this as a sign of a polar shift. This has the effect of allowing more solar particles in, thus increasing global temperature and changing the ionosphere. This has caused the jet stream to fluctuate, instead of flowing smoothly around the globe. Maps for pilots worldwide have already been revised so their autopilots will work. This has caused the recent increase in aberrant weather patterns. Now, back to the task at hand. There are many that think because he was good at one thing then he must be good at others. This has never been, nor is it now a truth. Most of us, even the best, are generally only good at one thing. Everyone, no matter who, has a particular talent that when nurtured becomes better. Bernard is no exception. He was good at a particular style of oriental pottery, that’s it. His early life was marked by a distaste for education until he discovered art. There are many, many sites with heaps of information on his art, life, work and travels, coupled with his relationships. I suggest you look at Wikipedia and The Baha’I websites along with many others. I will stick to this ramekin. It is a simple earthenware bowl with a stem handle and too small to be of any functional use except as a tasting bowl. Low firing heat. I got it from E-Bay and it as early example of his work dating from the 1930s. It’s a wonder that it has survived.